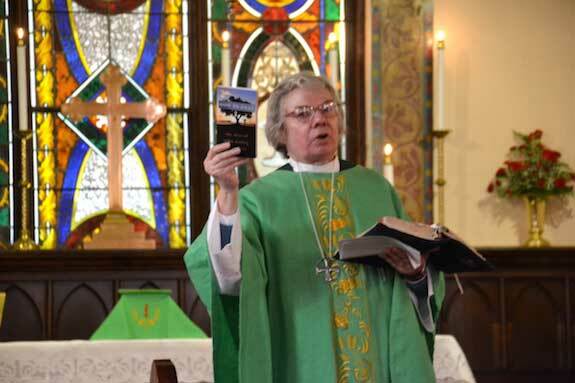 Photos by Tom Rivers: Linda Glantz, pastor of the United Methodist Church in Albion, preaches during this morning’s service held at Christ Church, an Episcopal Church. The United Methodists have their service at 9:30, followed the Episcopalians at 11 a.m.
Christ Church holds services for the United Methodist Church at 9:30 on Sundays, followed by the Episcopalians at 11 a.m.
ALBION – Two church congregations have been sharing a building for almost two years now, and the partnership has gone extremely well, leaders from both the United Methodist Church and Christ Church said today. The United Methodists have been holding services at Christ Church, an Episcopal Church building, since Easter in April 2015. 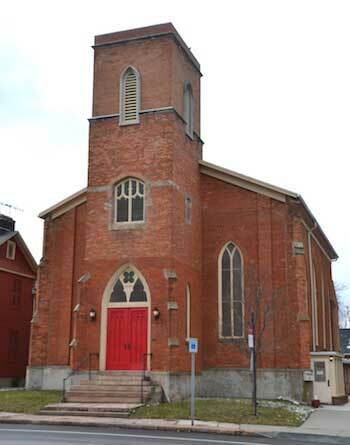 The United Methodists left their historic building at the corner of Platt and East State streets. That building faces a costly roof repair that church members said would take $1 million to fix. That proved too much for the congregation. They have had the building up for sale and the North Point Chapel, which currently meets at the Arnold Gregory Memorial Complex, has submitted an offer. The sale needs a final approval from the state Attorney General’s Office. North Point is the church that paid for fireworks in Albion on July 5 for three years. 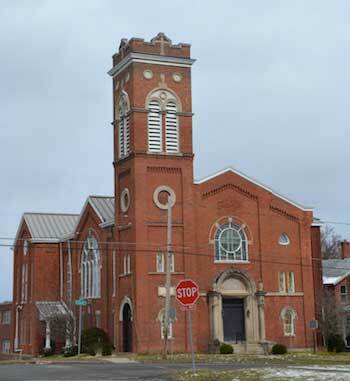 North Point has scheduled a 10 a.m. service on April 2 for the church launch at the former United Methodist building. Click here for more information. “It will be nice to see the building rejuvenated,” said Reid Cole, chairman of the United Methodist church board of trustees. He has been a part of the church for more than 50 years, since he was a kid. The United Methodist Church building has been vacant for about two years. North Point Chapel has submitted an offer than has been accepted by the United Methodists, but needs final approval from the State Attorney General’s Office. 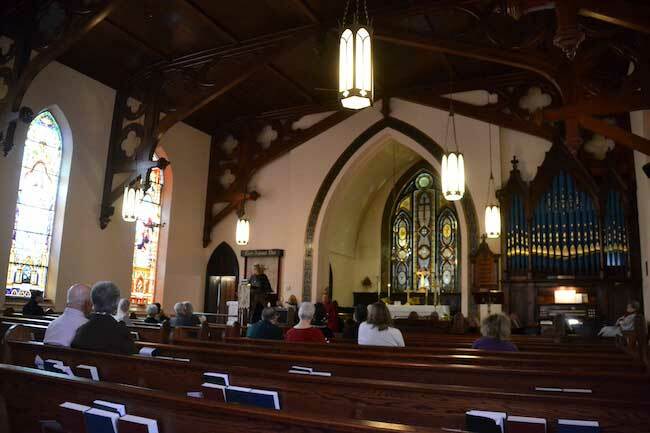 Cole and other United Methodists praised the Episcopalians for sharing their building at 26 South Main St.
Follett attended services at the United Methodist building for more than 50 years. She continues to play the organ for church services. The United Methodists also have choir practice on Wednesday at Christ Church. The United Methodists have their hymnals and songbooks on a cart and hand them out for their services. There are about 30 to 50 regular attendees on Sundays for the 9:30 service. “It’s been good to be able to share space,” Follett said. The churches share the costs for heating, snow plowing and cleaning services. That has helped the Episcopalians. Each congregation goes to each other’s community dinners, and other celebrations. “It’s been a win-win,” said Jan Cheverie, a member of the Christ Church vestry. Christ Church holds services at 11 a.m. That later service worked well with scheduling for the United Methodists, which have had an earlier worship time. 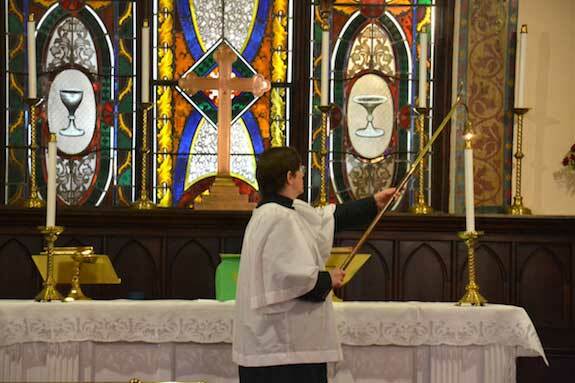 Jan Cheverie, serving as acolyte during this morning’s Episcopal service, extinguishes the candles at the end of the service. The United Methodists have a coffee hour after their service, and sometimes that stretches until after the Episcopal service. Members from both congregations can find themselves socializing until well after noon. Linda Glantz became pastor on July 1 of the United Methodist churches in Albion and Holley. She is pictured inside Christ Church today. Glantz is leading both United Methodist churches in planning for the future. Linda Glantz started as the United Methodist pastor on July 1. 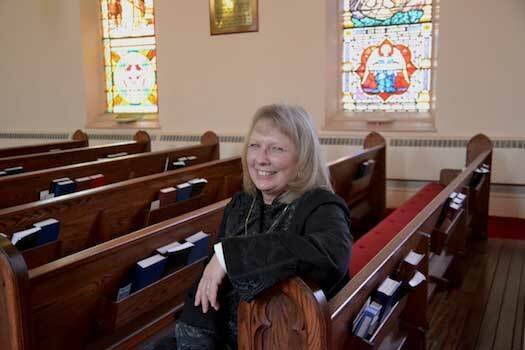 She also leads the United Methodist congregation in Holley. She said the Albion congregation experienced a loss with leaving its building that was its home for more than 150 years. Now the focus is on the future and being a vital congregation for years to come. The church leadership is meeting to focus on the next steps – including where to hold services. The United Methodists may decide to stay long-term in the shared role with Christ Church, or it may look for another spot. The church leadership will weigh that decision. “It is a process to get the church from healing to seeing what the future holds,” Glantz said. The United Methodists are going to meet the next few weeks in the fellowship hall for church services. That way they can decorate for the Lenten season. Right now there is some shuffling of sacraments and other elements in between the two services. The Episcopalians are grateful to see their historic building, the oldest of the church buildings at the Courthouse Square, being better utilized, said Kevin Doherty, a warden with the church. “A used church building is much better than an unused one,” he said after today’s services. During announcements today at Christ Church, Doherty urged the group to attend an Ash Wednesday observance this Wednesday from 5 to 7 p.m. led by the United Methodists. The Rev. Judy Hefner, supply priest for Christ Church, shares an announcement at today’s service. Hefner is holding a prayer devotional that the United Methodists have available for the everyone. Judy Hefner, the church’s priest, also held up a prayer devotional made available by the United Methodists. She urged the congregation, which today numbered 10, to read the booklet. She said she would include it in her own daily devotionals. Hefner, a supply priest, said there hasn’t been any hard feelings among the two congregations, which have different styles of worship. “It’s been good to be able to share space,” she said. 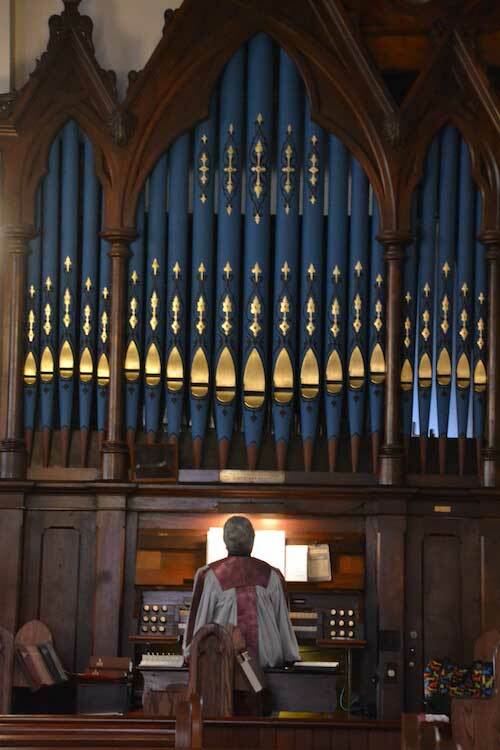 Marie Follett plays the organ at the Christ Church. Follett has been a member of the United Methodist Church for more than 50 years.